The sad news has arrived that Venetia Phair has passed away in her native England at the age of 90. It was her idea to give the solar system's ninth planet (or first "Trans-Neptunian object" if you're some kind of wacko liberal astronomer... just kidding :-) the name "Pluto". 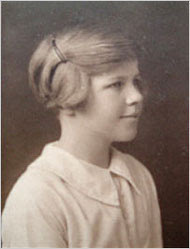 Nine years old at the time in 1930 and born Venetia Burney, she was already quite knowledgeable about astronomy and classical mythology when "Planet X" was discovered. Click on the link above for the entire fascinating story of how one little girl's breakfast-time suggestion became enthusiastically embraced by not just the scientific community, but also by the entire world. It should be noted that the IAU’s controversial demotion of Pluto is very likely not the last word on the subject and in fact represents only one interpretation in an ongoing debate. Only four percent of the IAU voted on this, and most are not planetary scientists. Their decision was immediately opposed in a formal petition by hundreds of professional astronomers led by Dr. Alan Stern, Principal Investigator of NASA’s New Horizons mission to Pluto. Stern and like-minded scientists favor a broader planet definition that includes any non-self-luminous spheroidal body in orbit around a star. The spherical part is important because objects become spherical when they attain a state known as hydrostatic equilibrium, meaning they are large enough for their own gravity to pull them into a round shape. This is a characteristic of planets and not of shapeless asteroids and Kuiper Belt Objects. Pluto meets this criterion and is therefore a planet.